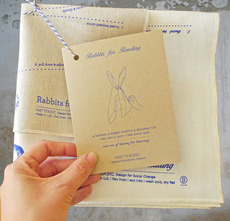 Fusing fun & reading, Rabbits for Reading is a charming flax linen set that benefits children's literacy programs. Fold the linens according to the special instructions printed upon them, and they become rabbit puppets! Each puppet is a reading toy that promotes learning through play and bonding. The designer's grandmother used to play with her using this napkin rabbit trick and she has been sharing it with others ever since. The transformation of a simple napkin into the puppet helps spark a child's creativity and also becomes their delightful reading buddy, investigating books and lands of imagination together. Rabbits for Reading puppets support the love of reading by donating 10% of proceeds to S.T.A.I.R. and First Book. S.T.A.I.R. is a New Orleans based tutoring group helping elementary school students build confidence with free reading tutors at public schools. First Book provides books to children in need, whether to schools or individual groups. 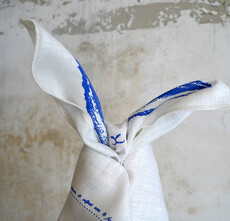 These fine flax linens are made in New York state in the Irish tradition by a family in business for over 150 years. Sewn and printed in New Orleans using eco inks.